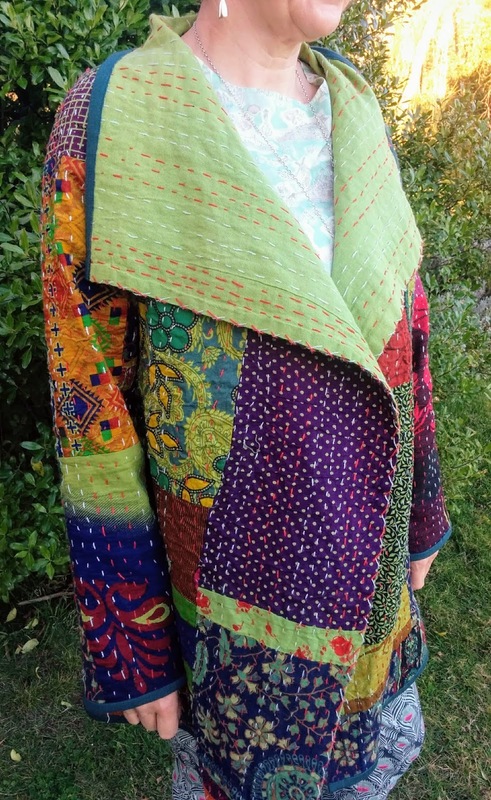 I have coveted a kantha jacket since I saw one made from a bedspread at my first Design Outside the Lines (DOL) retreat with Diane Ericson and guest tutor Carol Lee Shanks back in 2014. My covetousness was so strong that whilst still in Ashland I almost purchased a kantha bedspread. I only refrained because I was worried about what I might purchase at the Houston International Quilt Festival and the need to get everything home to New Zealand. Fast forward to 2018 and you can now buy kantha cloth by the yard. I just had to indulge and was lucky enough to find a colourway that fit in with my travel wardrobe. Straying slightly off track - I have to enthuse for a few lines about the whole DOL experience which is so energising and if you ever get the chance I encourage you to take a class with Diane. Not only is Diane's teaching inspiring, if you aspire to be a more creative sewer, the other students are amazingly creative and willing to share. I am quite upset that I won't be able to do a DOL retreat this year on my way to Quilt Festival because Festival is a week later. 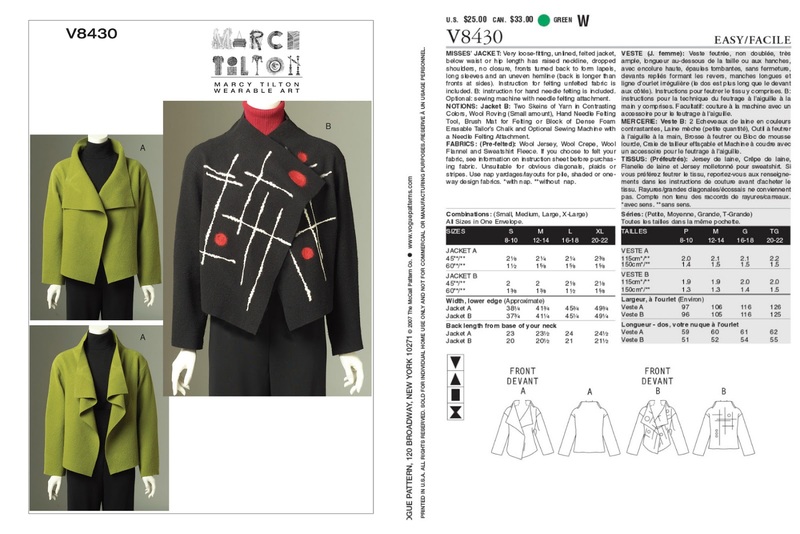 If you want to see the inspirational creative garments DOLlies produce (DOL students are called DOLlies) details of those who blog can be found here. This jacket is everything I hoped for and I just love it. All the stars aligned and it was as pleasurable to sew as it is to wear. It was also a fantastic jacket for my travel wardrobe, being a very good layering piece. There was a recent purchase during the Liberty of London sale of some velvet which I think would translate really well into this jacket. Or maybe an even longer version, although I do also have my eye on the Victory Patterns Ulysses Trench. Decisions decisions. 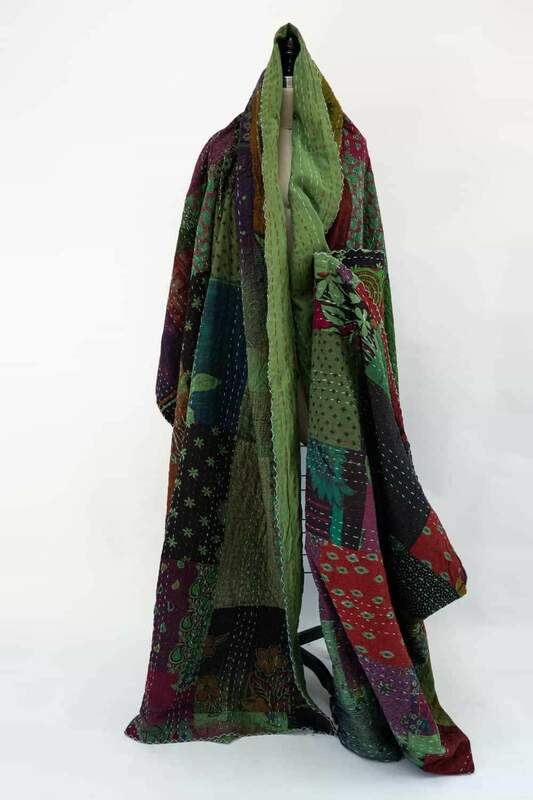 This kantha cloth is from either Stonemountain and Daughter Fabrics in the green / pink colourway. or Marcy Tilton. 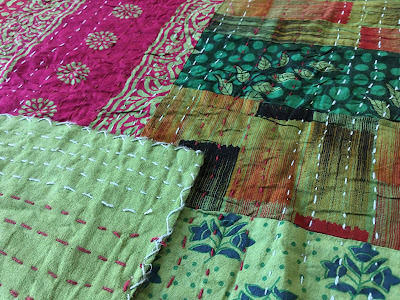 The kantha cloth comes in a number of different colourways and I am considering another purchase! The kantha cloth that is currently being sold as yardage is made in India. It is made from block-printed fabric that has been hand-stitched, using a large running stitch, to a backing fabric to create a quilt like cloth. Often the fabric used comes from old saris. I love this pattern, Vogue 8430 by Marcy Tilton, an oldie but a goodie. My pattern is copyrighted 2007 and it is still available on the Vogue Patterns website so it must be popular. It was made many years ago, in a black boiled wool, as per the pattern but the sleeves are a bit short or maybe normal length and I am used to wearing them a bit long. Anyway it hangs in my wardrobe unworn and I have always wanted to make another one. It seemed like the ideal pattern for my kantha jacket - no darts and minimal shaping, plus I could cut the centre front edges on the selvedge. The pattern alterations were many but style related rather than fit. I wanted set in sleeves not a dropped shoulder. I measured across the shoulders of a favourite coat pattern which fits well and marked that width across the back of V8430. Unfortunately the width of my shoulders is pretty much the width of the back collar piece so I had to reshape the collar piece and it now fits more closely around my neck. I then used the armhole from my favourite coat pattern to re-draw the armhole. I didn't alter the original sleeve in V8430 I just used the two piece sleeve from my favourite coat pattern. The same alterations were made to the front pattern piece shoulder width and jacket length as for the back. 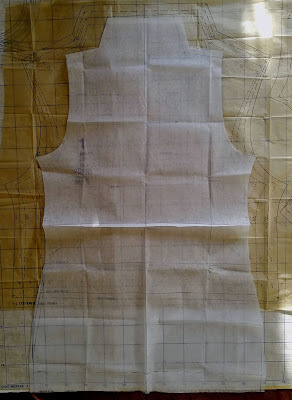 Making sure that the shoulder seam and the collar height matched the back pattern piece. I also measured where the armhole should finish for the front based on matching front and back at the side seam. The reason I did this is that the front armhole shape was altered by the creation of the cowl to achieve the waterfall effect for the original jacket front pattern. I needed to retain this shape, otherwise I would loose the waterfall effect, but with the same armscye length as my favourite coat pattern. I made a template of my favourite coat armscye and clipped it to but not through the notch. 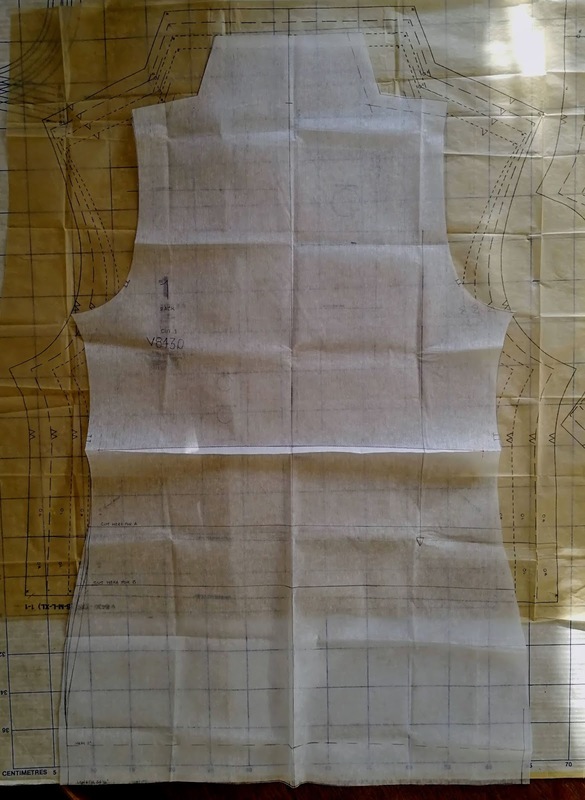 By cutting the template at the notch I was able to shape the armhole so that it matched at the shoulder seam and the side seam. Sorry I don't have a picture of the armsyce template as I threw it away when I had drawn the new armhole on the front jacket piece. The centre front has some subtle shaping which I ignored in order to use the selvedge of my kantha fabric. I wanted to use the selvedge as it is made by folding the fabric edges under and holding them in place with an overcast stitch which is made to look like herringbone stitch. The two fit alterations I made were: (1) forward shoulder adjustment which is really priceless for me as it stops the front of my garments sliding to the back; (2) a small sway back adjustment. (4) trim half of the seam allowance away on three of the four fabrics (two plain sides and a pieced side). 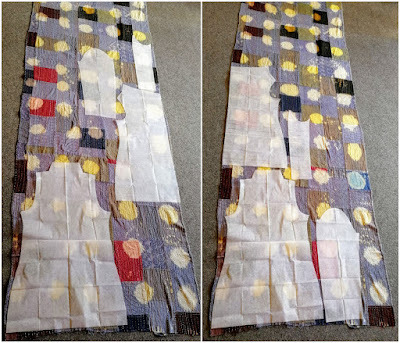 (5) fold the second pieced side over the trimmed fabrics and stitch down. For the neck edge and the hems I used a merino fabric (which was just the right colour) as a binding. By using faux flat felled seams and binding the edges the jacket is reversible. So far I have only worn it patchwork side out, and I think of the patchwork side as the right side. I do however have some fabric to make trousers, which would look great with the green side so you never know it may be worn "wrong" side out one day. The jacket doesn't have any form of closure. I purchased a pink metallic zip from Stonemountain and Daughter at the same time I bought the kantha fabric intending to have a diagonal exposed zip. 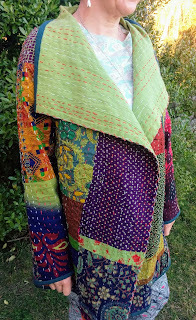 However the zip was a much brighter colour than I anticipated and totally wrong for the kantha fabric. Secondly my beloved felt that a zip was too mechanical and that my jacket needed something more organic for its closure. So for the holiday I used a large silver, modern equivalent of a kilt pin. This gave my notions shopping in London some purpose. I now have three options, as seen in the photo below. All three options were purchased because they had large holes in the button and could be attached to the jacket using a strip of the kantha fabric through those holes. The Liberty button and the bottom left toggle would fasten through a fabric loop on the other side. The toggle on the bottom right is magnetic and the two pieces of the magnetic toggle would both be attached using a loop of the kantha fabric. Now I just need to make my mind up about which I prefer. Or I could abandon a fixed closure altogether and continue to use a kilt pin equivalent (I do have a few varieties to choose from) or a large brooch. 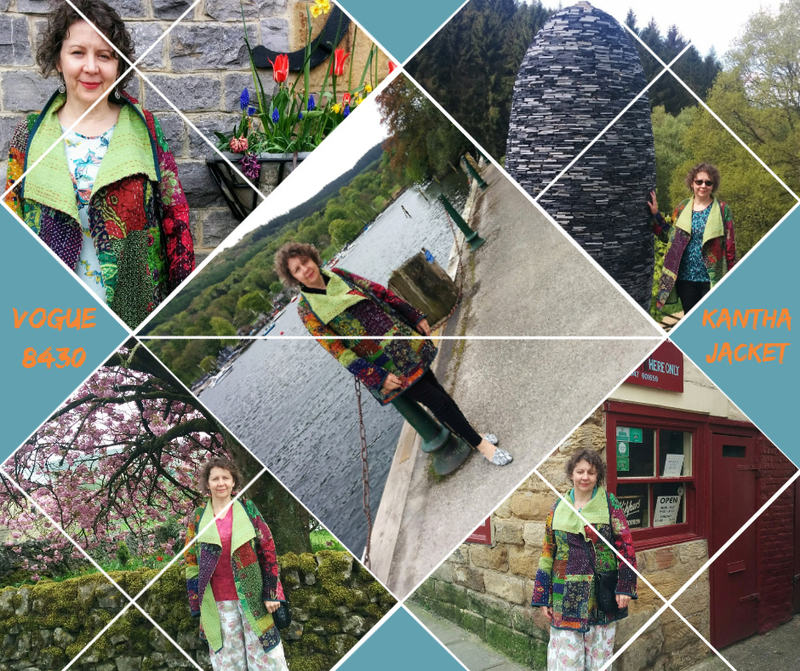 I don't actually have an outfit of the day but I do have a montage of the jacket out and about during the trip to England in May. It is a bit too cool here at the moment (being Winter) for me to wear a cotton jacket. The jacket is stunning and really shows off the fabric. Seeing the yardage draped on the dummy, it would look amazing in a longer version as well. Love the Marcy Tilton pattern - a great base to start from. A longer version is highly likely to appear especially as some quality time has been spent browsing Etsy. 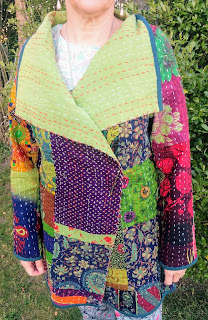 I so love this jacket and you did a fabulous job with the pattern changes. 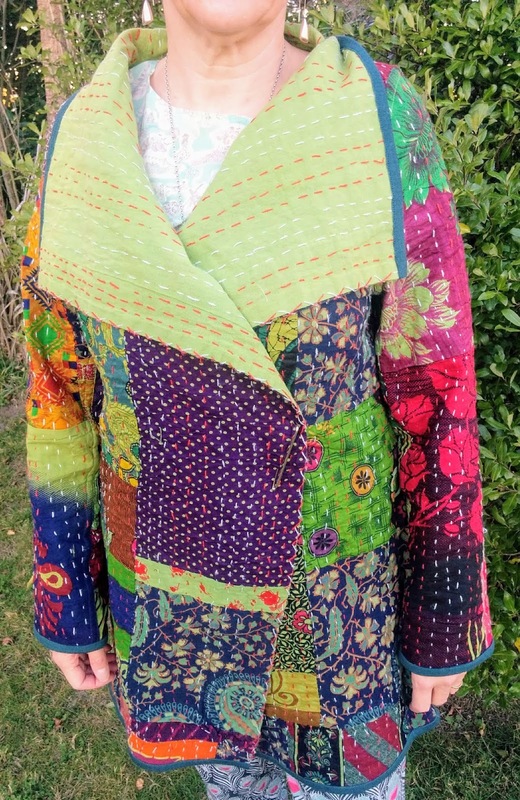 I'm going to bookmark this one because I too would love a kantha jacket and kept putting various bedspreads into my eBay cart over the years. And I too want a two piece sleeve on these simple jackets. A Lisette pattern, Butterick 6244, is my favorite version right now but I find it odd that they wouldn't make a two piece sleeve especially when it is meant to be a long coat. Yes B6244 would be a great option. I have given up waiting to find the ideal pattern, the focus is too often on simple these days. It was so freeing when I realised I could just mix and match to suit me. If you have a favourite two piece sleeve you can just transfer the armhole to the garment you want to make and happy sewing. Gorgeous outcome. I love a coat/jacket like that for travel because it delights every day. It was wonderful for travel there was always some nuance of colour or fabric design that caught my eye afresh. Plus it was easy to wear, although there was a minor crisis when I thought I had lost my kilt pin. What a wonderful blend of pattern and fabric-just lovely! A neat freak trying desperately to be a more creative sewer.